The Solution below shows the Gb melodic minor key signature on the treble clef and bass clef. This step shows the enharmonic equivalent of the Gb melodic minor scale key signature on the treble and bass clef, including the note name adjustments relative to the natural minor scale in the same key. Rather than use a key signature that would in theory contain double sharps or flats, usually the key signature of the replacement minor scale F-sharp, above is used, as shown below. The Gb melodic minor scale has 1 double-flat, 5 flats. 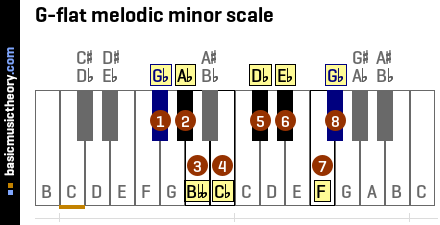 To understand why the G-flat melodic minor scale has 1 double-flat, 5 flats, have a look at the Gb melodic minor scale page, which shows how to identify the note positions and names for this scale. This melodic minor scale is based a natural minor scale that is not on the circle of 5ths - Gb natural minor scale, which means that its key signature would have double sharps or flats. In ths case, the melodic minor scale having the same note pitches played in the same order is the F# melodic minor scale, so its key signature will be used instead below. The next step will show the F-sharp natural minor key signature as a basis for calculating this melodic minor key signature.